Oil and fuel analysis go hand in hand, especially as fuel quality can have a great impact on reliability. At STS we can help with routine monitoring of fuel quality, help diagnose specific problems, identify contaminants or arrange full specification testing to the relevant standard. This suite is designed to monitor in service diesel fuels as used in vehicles, mobile equipment and generation plant. A measure of total magnetic ferrous debris in the sample irrespective of particle size. Does not detect non-magnetic ferrous debris e.g. rust. Combine with Elemental Analysis and ISO Code for comprehensive assessment of the wear situation. 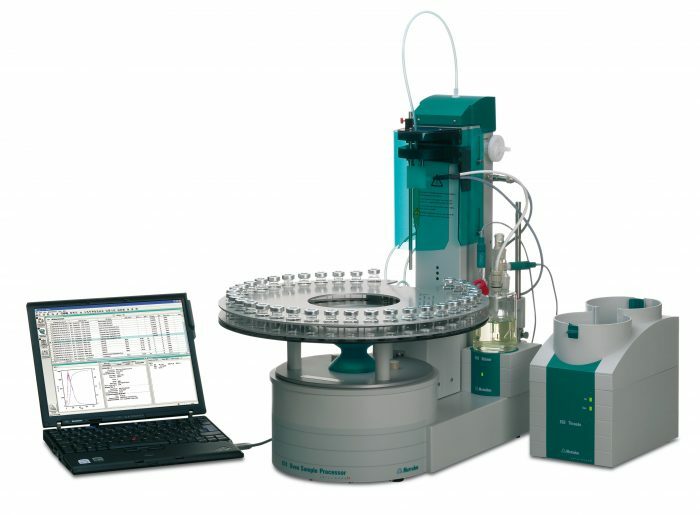 Induction Coupled Plasma Optical Emission Spectroscopy (ICP-OES) is used to measure the concentration of over 20 different elements in the oil. These include wear metals, additives and contaminants. By monitoring wear metal concentrations the wear rate and its origin can be established. Trending additive levels ensures that the right oil is used and that it remains suitable to the task, while measuring levels of contaminants helps prevent severe wear and loss of function. For grease and debris samples a Rotating Disk Electrode Optical Emission Spectrometer (RDE) is used. This eliminates a lot of cross-contamination issues and, as no dilution with solvents is required, allows for more accurate measurement of heavily contaminated samples which would settle at the bottom of the test tube if an ICP-OES was used. Excess water in the oil reduces the lubricating effectiveness by disrupting the oil film, accelerates corrosion (i.e. rusting of iron and steel surfaces), depletes and/or degrades additives and accelerates the aging (oxidation) of oil. Where large quantities of water are present oil may become emulsified. 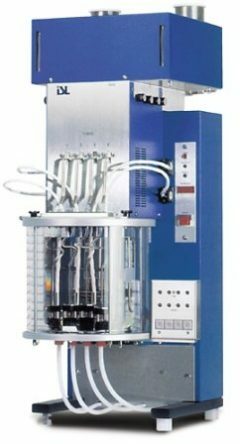 The emulsions can combine with insoluble oxidation products to form sludge which impairs the operation and reliability of equipment. In addition excessive water if present as free water can promote bacteria growth or form hard deposits on bearing surfaces. Fluid cleanliness is particularly critical for hydraulic and turbine oils. High levels of particulates, especially if the particles are abrasive (e.g. silica), can increase wear of components and lead to reduced life and premature failure. It has been demonstrated that improving cleanliness by even a couple ISO Codes can lead to doubling of the expected life of a component. Conversely, contaminated lubricant will greatly reduce component lifespan and increase costs. Fluid cleanliness is quantified by counting particles in prescribed ranges of particle sizes. It is typically expressed using an ISO 4406, a NAS 1638 or an SAE AS4059 cleanliness code. There are several ways of obtaining the particle count with the most common being instrumental particle counting and the patch test method. Most instrumental particle counters relate a change in the amount of light (either visible or laser) transmitted through the fluid into a particle count using a stored calibration. When a particle flows between the light source and the sensor, the measured output drops and this is interpreted as a particle of a certain size. Some instruments scan over a particle and are able to capture its shape and outline. Other systems measure a pressure drop as the oil is passed through a series of sieves. 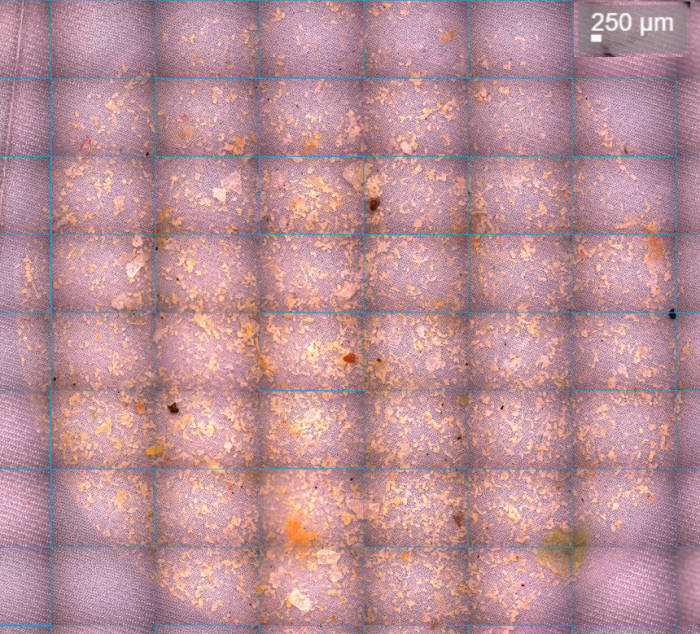 Another approach is to pass the fluid through a filter membrane and with the aid of microscopy to either count the deposited particles or perform a comparison with reference slides. The advantage of the latter approach is that, as well as obtaining the ISO Code, the types of wear and contamination particles can be examined and captured, giving further insight into the types of wear or contamination. This method is also insensitive to air bubbles and water droplets, which can interfere with the readings of the instrumental particle counters. An example of such patches can be seen in the slideshow. At STS we have invested in a new state of the art Leica motorised microscope and camera system with a range of illumination options. 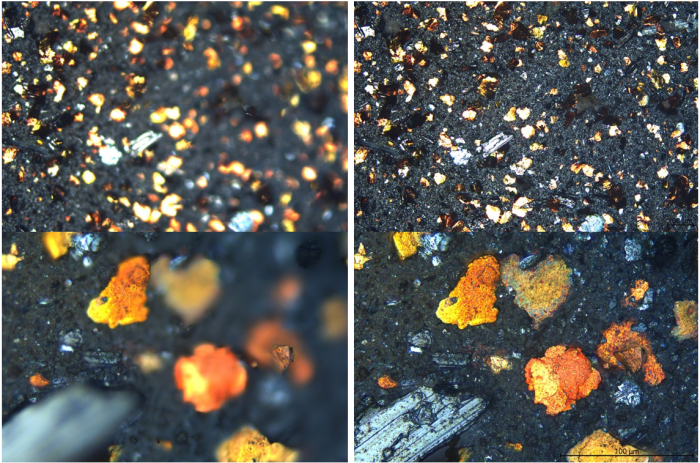 We are particularly excited about Darkfield Illumination - a way to light up the patch from all sides and get better definition of difficult slides and translucent contaminants in particular. We are also enjoying the Z-stack feature - it combines in-focus areas from multiple images to achieve a single fully focused composite as shown below. The overview/tile stitching facility lets us construct overviews of an entire membrane or ferrography slide. In the following overview we were able to use Dark Field illumination to successfully separate translucent particles from the woven 11µm membrane patch, which is also translucent. The following overviews show differences in large (inner ring) and fine (outer ring) particle densities in two ferrography samples. Biological contamination of fuel tanks and large circulating oil systems (such as steam turbines, paper machines, etc) is a growing and expensive problem. Biological contamination can be in the form of bacteria, yeasts, moulds or fungi and is most likely to happen where water contamination is present, although it doesn't necessarily take that much water - 500ppm may be sufficient. These microbes consume organic material from the oil or fuel and particularly enjoy warm temperatures, stagnant/low flow areas, an oxygen supply for accelerated growth and suspended particles to use as initial colonisation sites. These colonies can clog control systems, degrade oil quality and performance and produce corrosive byproducts. They can block filters and, in the case of contaminated diesel (where it may be referred to as Diesel Bug), fuel injectors. We can check your samples for evidence of biological contamination. Water is used to extract potential contaminants from the oil/fuel sample. This is then deposited onto a dip slide with growth medium. The slides are incubated for a week and checked for colonies of bacteria, yeasts and moulds. Each sample is run in duplicate to avoid false positives and a clean water blank is tested to ensure no water-borne contamination is introduced. If biological contamination is discovered you will need to consider flushing and cleaning the system as well as adding a suitable biocide into the fresh oil charge. It is also important to take steps to minimise future ingress of water and other contaminants. From Petrol in Diesel to maliciously added contaminants we can help work out what ails your engine. "The flash point of a volatile material is the lowest temperature at which vapours of the material will ignite, when given an ignition source." In practical terms knowing the flash point is safety critical for many applications as reduced values mean increased risk of explosion or fire. Reduced flash point can indicate ingress of fuel (engines, generators), dissolution of compressed natural gas (compressors), ingress of pumped process fluids (pumps and other systems) or degradation of the lubricant (especially in thermal/heat transfer fluids and other high temperature applications). Flash point testing can help detect petrol in diesel fuel. Engine sump oil in many emergency generators, lifeboat and fire pump engines suffers from fuel dilution due to intermittent running. Monitoring the flash point ensures that this safety critical kit is healthy and ready to go. Fourier-transfer Infra Red Spectroscopy (FTIR) is a powerful tool for analysis of oil, grease and fuel samples. It is especially useful for monitoring and identifying certain types of contaminants. The underlying principle is that infrared energy from the source is absorbed in the sample at wave lengths which are characteristic of specific molecular bonds. Each scan generates an FTIR spectrum which can be analysed and interpreted. 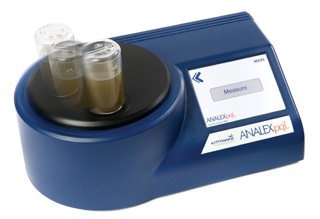 At its most basic the technique can be used to measure predetermined parameters, such as oxidation, nitration, sulphation or presence of fuel and glycol in an engine oil. Some of those require prior calibration and a scan of a virgin sample to be used as reference. More advanced analysis can help monitor degradation, identify and match unknown contaminants, verify lubricant formulation or help identify and source an unknown lubricant. In some cases Gas Chromatography coupled to Mass Spectroscopy (GC-MS) is called upon to work in tandem with FTIR analysis on particularly tricky samples, where exacting information is nonetheless required. Fatty Acid Methyl Ester (FAME) is the primary constituent of biodiesel. A certain percentage of FAME in forecourt diesel fuel is allowed (currently up to 7%), however not all engines are able to cope with greater concentrations. Determining the biodiesel content of the fuel may be necessary to diagnose engine failure. Some of the problems caused include "corrosion of fuel injection components, low-pressure fuel system blockage, increased dilution and polymerisation of engine oil, pump seizures due to high fuel viscosity at low temperature, increased injection pressure, elastomeric seal failures and fuel injector spray blockage". Distillation is a technique for characterising petroleum fractions and products. It can be used to verify if a fuel sample matches the expected type. 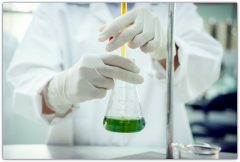 Modern techniques utilise Gas Chromatography to simulate the distillation process reducing time and cost. Whether it's EN228 Petrol, EN590 Diesel or a more exotic specification we can tailor a testing programme to match your needs.